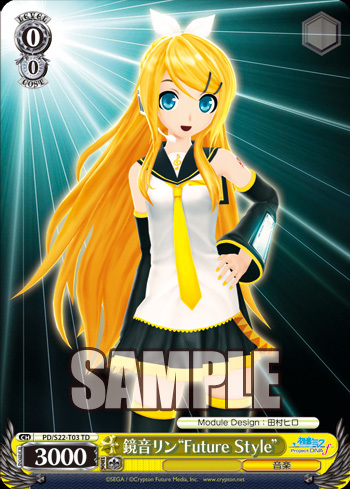 Weiβ Schwarz Cards of the Day: 6th of March | TCG, shiyo? For the first time since the Project Diva previews have started we’ve got a day without any Miku. Instead we’ve got Rin, Len and Luka. [CONT] During your turn, this card gains Power +1000. 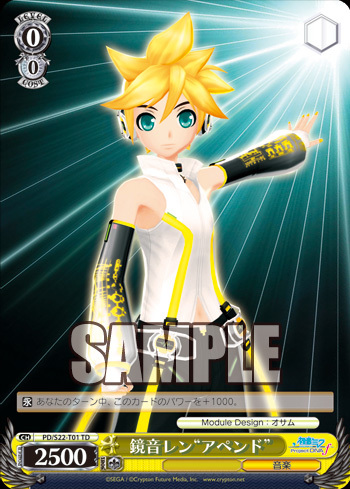 This Len is the most basic kind of attacker after plain Level 0 vanillas. He can overpower or suicide with plenty of other Level 0s, without any commitment on your part. However he’s unlikely to last much beyond that turn, due to only being 2500 on defense. If you can play it, a Level 0 that can consistently stay at 3500 or above will usually be better. Your basic Level 0 vanilla. Every set has it, and it’s at a consistent power without drawbacks, for when you don’t have anything better. 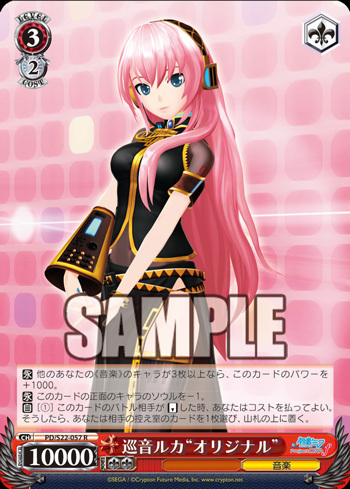 [CONT] If you have 3 or more other «音楽 Music» characters on your Stage, this card gains Power +1000. [CONT] The character facing this card gains Soul -1. [AUTO] [(1)] When this card’s battle opponent is Reversed, you may pay the Cost. If you do so, choose 1 card from your opponent’s Waiting Room and place it on top of their Deck. Our final card of the day is a pretty powerful Luka card, who not only has above average power, but also helps increase your damage output, whilst reducing your opponent’s. Thanks to her first effect she should practically always be an 11,000, meaning she can defeat many of the other Level 3s in the game. This will be very useful for making sure you get a chance to use her 3rd effect. Her 2nd effect is a standard Soul reduction effect, which will usually help to keep you in the game longer, but might not be so welcome once you get to 6 damage. Her final effect allows you to cause more damage to your opponent and makes it easier to win the game. It could also potentially mess up some of your opponent’s plans. Her extra power should also make it easier to defeat an opponent’s character in battle and use this effect. Most of the time you’ll probably be using this effect to decrease the chance of your opponent cancelling your damage, or guaranteeing a single point of damage. Other times you might use it to make sure your opponent draws a useless card next turn. You might even get to use it during your opponent’s turn sometimes, to try and get certain cards stuck in their Stock, if they still have attacks left that turn.